Dubai, UAE, 30 June 2018: Football fever is here and there's now a delicious way to enjoy it. 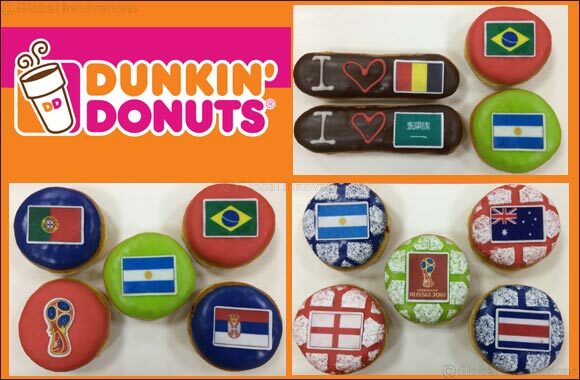 Fans can now choose the flags of their favourite teams as frosting on the donuts, all thanks to the premium, limited-edition range at Dunkin' Donuts. What's more, it is available in Mango and Banana flavour, and comes with a delicious chocolate filling. In addition, a special offer is available on the above range of donuts when you buy a dozen at any outlet in the UAE. If you are enjoying the game at home you can place an order online and get it delivered to your doorstep through Deliveroo, Talabat or Uber Eats. And, if you love to complement your donut with some coffee, there's a wide variety of choice. Without a doubt, Dunkin' Donuts is going to win new fans this Football season. Since its inception in 1950, Dunkin Donuts serves over 5 million customers, every day at over 13,000 outlets in 40 countries. In other words, being everybody's favorite destination for coffee, donuts and a quick bite, it has become one of the market leaders of the segment.